Baylor Arlington is proud to partner with organizations across the Arlington community and beyond to provide meaningful programs and events that enhance the culture, education and health of individuals and families in our area and across the globe. As the only hospital in Dallas-Fort Worth that’s focused strictly on providing unsurpassed orthopedic and spine care, we always strive to help our patients get back to enjoying life. We take this one step further by supporting organizations working across a spectrum of philanthropic causes to enhance the communities where our patients live and work, and in international locations where we can make the greatest impact. We understand the expert care we provide at Baylor Arlington can be financially difficult for some of our patients. We’re proud to provide financial support for medical procedures and services for patients meeting certain criteria. This support ranges from help with large insurance deductibles, copays and premiums, to assistance with everyday living expenses related to a patient’s treatment. Medical financial support is based on a patient’s need, insurance coverage and ability to pay, among other factors. More information and application instructions and forms are available here. Baylor Arlington is proud to be the title sponsor of Levitt’s 2016 concert season. The Levitt Pavilion for the Performing Arts in Arlington presents more than 50 free outdoor concerts a year with a diverse concert calendar of professional musical artists, from world music to jazz and home-grown Texas country to hot Indie artists. Last season, the Levitt Pavilion brought more than 115,500 people to Downtown Arlington to enjoy live music in a safe, fun, casual atmosphere under the stars. This year’s concert calendar kicks off on Friday, Sept. 2 with Grammy-winning artist Brave Combo, and wraps up on Saturday, Oct. 8, with the B-52s, the “world’s greatest party band.” Visit www.levittpavilionarlington.org for the full schedule and more details. Baylor Arlington also partners with The LOT Downtown in Mansfield to provide another unique place for people to come together to enjoy life through the arts. This Live Outdoor Theater (LOT) is an outdoor amphitheater and gathering spot located on Main Street in downtown Mansfield and provides free, family-friendly entertainment including movies, music and theater productions. The LOT Downtown opened in April 2016 with a concert featuring country music artist Sawyer Brown, with proceeds allowing The LOT to provide free entertainment throughout the year. Fall concerts kick off on Saturday, Sept. 3. For a complete calendar of events and more information, visit www.thelotdowntown.com. Baylor Arlington joined River Legacy Living Science Center in June of 2016 as an annual partner. The River Legacy Living Science Center opened in 1996 and features a 12,000-square-foot nature center with surrounding trails and pond overlook. The nature center houses the River Legacy Foundation’s environmental education programs, including Nature School & Summer Camps, and offers a full calendar of public programs and events. It also includes interactive environmental exhibits and aquariums and terrariums with native wildlife. The Science Center is the gateway to River Legacy Parks, which features over eight miles of paved hike and bike trails, a 10-mile mountain bike trail, picnic areas, playgrounds and canoe launch. In addition to our annual partnership, Baylor Arlington is also proud to support the Science Center’s Exhibit Transformation Campaign Project, a $2.5 million renovation designed to enhance and expand the Center’s programs, curriculum and activities. For hours of operation and more information, visit www.riverlegacy.org. Baylor Arlington is a proud supporter of the Boys & Girls Clubs of Arlington, which provides programming and services to help children and youth reach their full potential as productive, caring, responsible citizens. They do this through programs including sports, arts and academics, and activities focused on leadership, character, health and life skills. BGCA serves approximately 5,000 children across the Arlington area. Baylor Arlington recently sponsored the 2016 Cinderella Charity Ball, which raised needed funds to support capital improvements, programs and services. The 2016 event raised just more than $800,000, raising the 56-year cumulative earnings of the ball to a $10 million. More information on the Cinderella Charity Ball can be found at www.cinderellacharityball.com. In addition, Baylor Arlington is the proud Presenting Sponsor of Party for a Purpose, which aims to raise critical funds needed to deepen the BGCA’s impact on local children. The casino-themed event takes place Oct. 1. Visit www.bgcpfp.com for tickets and more information. Baylor Arlington is pleased to support the Mansfield ISD Education Foundation. The Foundation works to provide funding to MISD teachers for innovative projects and programs that are not funded by tax dollars, and that go beyond the normal classroom experience. The Foundation also works to support and recognize educators for creative and exemplary teaching. Funds from Baylor Arlington specifically have supported athletes, health science students and the general student population at Ben Barber Career & Technology Academy. Visit www.mansfieldisdfoundation.org to learn more. Baylor Arlington is a proud sponsor of the Inspiring Hope Luncheon, benefiting The Salvation Army’s programs and services in Arlington, Mansfield and surrounding communities, including its Youth Education Town (YET). The Salvation Army provides various character-building activities for kids of all ages, including educational, recreational and spiritual programs. 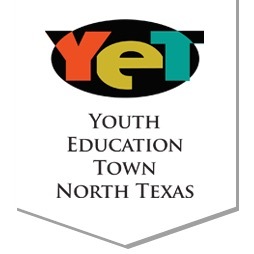 The YET offers area children programs focused on education, technology, creative arts and personal development. Visit www.salvationarmyyet.org for more information. Baylor Arlington is proud to support the Arlington Soccer Association, which offers recreational and competitive soccer for children and youth ages 3 through 19. ASA was formed more than 35 years ago, and has developed thousands of players and coaches by creating a program where children can learn the game of soccer and the importance of teamwork and sportsmanship while having fun. Visit www.arlingtonsoccer.org for more information. Baylor Arlington recently sponsored the 2016 Walk to Cure Arthritis at Globe Life Park in May 2016. The Walk is the Arthritis Foundation’s signature event that unites communities across the country to put an end to arthritis by promoting awareness and raising needed funds for research and programs. The event features a one- and three-mile walking course and fun activities for the entire family. More than 864 walkers participated in the Arlington event. Baylor Arlington was proud to win the Walk with your Doc award, thanks to our own Dr. Jason K. Lowry, who walked one mile with 10 patients who have undergone hip or knee replacement. We also were recognized – thanks to more than 200 of our doctors, employees, patients, friends and family – as the organization with the most participants in the Walk. Our staff and volunteers also passed out water bottles and provided chair massages to Walkers. For more information on the Walk to Cure Arthritis and the Arthritis Foundation, visit www.arthritis.org/get-involved/walk-to-cure-arthritis/. 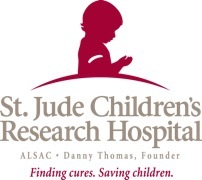 Baylor Arlington is a proud supporter of St. Jude’s Children’s Hospital, a leading pioneer in research and treatments for kids with cancer and other life-threatening diseases. We recently sponsored Bennett’s Bash, a fundraiser named in honor of St. Jude patient Bennett, whose courageous battle with cancer ended in April 2014. This year’s event raised more than $150,800 to support St. Jude in changing the way the world understands, treats and defeats childhood cancer and other deadly diseases. Visit www.stjude.org for more information. Baylor Arlington proudly supports Faith In Practice, which serves the poor of Guatemala through short-term medical mission trips that strive to reach those in the greatest need. Faith In Practice teams include more than 1,200 medical professionals and support personnel – including Baylor Arlington staff – as well as nearly 900 Guatemalan volunteers. These teams see more than 25,000 patients annually. For more information, visit www.faithinpractice.org. Eagle Condor Humanitarian (ECH) works in some of the most impoverished areas of South America – primarily Peru, Ecuador and Colombia – to break generational poverty and create self-sustaining improvements through education, hygiene and medical care, and skill development. Baylor Arlington is proud to support Eagle Condor’s work with the International Spine & Scoliosis Foundation, which allows American doctors to collaborate with Peruvian surgeons to enhance their skills and educate them about new procedures and tools. Visit www.eagle-condor.org for more information. Baylor Arlington is proud to join Baylor, Scott & White’s support of Canine Companions for Independence. CCI enhances the lives of people with disabilities by providing highly trained assistance dogs and ongoing support to ensure quality partnerships. CCI is the largest nonprofit provider of assistance dogs, and is recognized worldwide for the excellence of its dogs, and the quality and longevity of the matches it makes between dogs and people. The result is a life full of increased independence and loving companionship. The Lone Star Chapter of CCI serves the Dallas-Fort Worth area and opened the newest CCI regional training center in Irving in 2015. The Kinkeade Campus is the first partnership between Canine Companions and Baylor, Scott & White Health Care System. The training center offers ideal facilities for providing professional training for assistance dogs and preparing graduate teams for their lives together. For more information, visit www.cci.org/lonestarchapter. As the cost of providing medical education continues to rise, the Baylor Foundation relies on donor support to fund medical education programs that help secure the future health of our community. Thanks to generous donors, including Baylor Arlington, the Foundation plans to fund 23 residents and fellows in fiscal year 2016 at a cost of more than $2.4 million. Baylor Arlington’s support specifically supports the education of future physicians specializing in orthopedics and spine care. Click here for more information. National Time Out Day is a powerful tool that supports surgical nurses’ ability to speak up for safe practices in the operating room. Initiated as an annual awareness campaign in 2004, it has been consistently supported by The Joint Commission, the World Health Organization, and the Council on Surgical and Perioperative Safety for its ability to increase awareness of safe practices that lead to optimal outcomes for patients undergoing surgery and other invasive procedures. The team at Baylor Orthopedic and Spine Hospital is committed to conducting a safe, effective time out for every patient, every time. To learn more about Time Out Day, go to: Time Out Day. Baylor Orthopedic and Spine Hospital at Arlington recently installed a disinfection system to provide clean air for our patients. This extraordinary new system goes beyond filtering, disinfecting the air and removing virtually 100% of virus, bacteria and spore contamination. The System is an ideal supplement to the facility’s current air system. It adds an additional layer of airborne pathogen removal to achieve best practices in reducing the transmission of airborne bacterial and viral infections in the hospital. As the first hospital in the Arlington area to implement this technology, we are proud to take this proactive approach in providing cleaner air to decrease chances of infections in the hospital. Read more. Out Hunger is a nonprofit organization created to end hunger in our community, city, state and nation. Out Hunger charity events raise money and include Bike Out Hunger, Run Out Hunger and Tri Out Hunger. 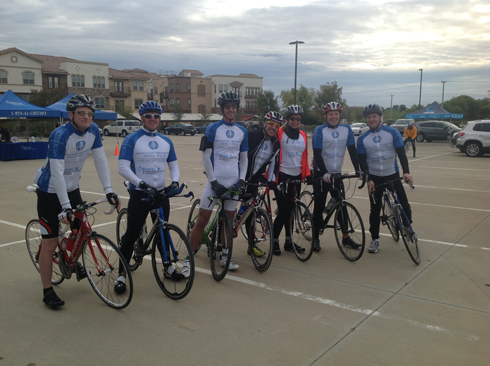 Bike Out Hunger held its first event in April 2010 with a six-day, 425-mile ride in Texas and welcomed 45 riders. Since then, the organization has broadened its event scope and dropped “Bike” from its title. 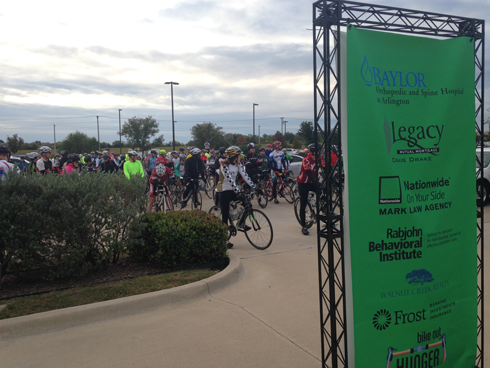 Baylor Orthopedic and Spine Hospital at Arlington participated in Out Hunger’s “Bike Out Mansfield,” which benefited the city’s weekend backpack feeding program. Many children on the reduced or free lunch program go hungry over the weekend, and this program provides them with meals while not in school.